This article is part of our series on SIGMA’s six-step succession planning process. Succession planning is an important initiative for any company to complete in order to plan for future personnel changes and minimize their impact on business operations. There’s no doubt that key employees will change over time—whether due to retirement, promotion, departure to another company or many other reasons. What’s important for every organization is to ensure that personnel changes don’t leave gaps in knowledge or experience that could affect operations and jeopardize the business. The first step in creating a succession plan is to determine the key roles in your company that have a big impact on performance, and would also be difficult to replace. These critical roles are the positions to focus on when creating your overall succession plan. 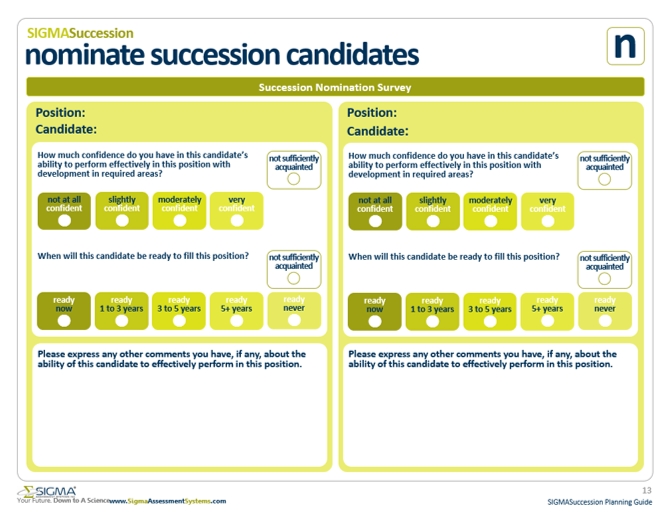 After identifying the critical roles to include in your succession plan and building success profiles, your management team can turn its attention to nominating succession candidates who could potentially fill each role. The purpose of this nomination process is essential to develop an inventory of the talent available to move into a critical role at some point in the future. To identify the people who could do so, your succession planning team will turn to the managers in the functional area the key role falls under (for example, finance or marketing). A succession candidate will most likely be discovered within this functional area and team—perhaps someone with a similar background or experience to the current employee in this position, or with exposure to the day-to-day responsibilities of the key role. However, the succession planning team should also consider looking across functions, departments, and teams to see if employees in different areas might also be good succession candidates. To facilitate the nomination process, SIGMA has developed a Nomination Survey that helps succession planning teams evaluate an individual’s potential to fill a particular role. The nomination survey helps keep the process fairly simple. It asks respondents to rate how confident they are that the candidate can perform the role, and how soon the candidate will be ready to move into the role. It also leaves room for respondents to add any thoughts or comments that might assist with the evaluation. How many candidates should be evaluated? While it is tempting to complete the Nomination Survey for only the top succession candidates, we recommend evaluating all staff relevant to the role you are planning for. The insights of the team members closest to the candidates may reveal someone that the succession team would not otherwise have uncovered. Once your succession planning team has received all the Nomination Surveys for all potential candidates for a particular role, you can compile the results to get a picture of the individuals who could be named in your succession plan to eventually move into that role. Your succession team should then discuss and validate the results, and make the final decision about the candidates’ readiness, and the team’s confidence in their potential. The final results of the nomination process will help the succession team develop your Succession Bench—a chart of successors and their relative readiness to take on a role. We’ll take a look at how to build and maintain your succession bench in our next succession planning article. Contact us to discover our Succession Planning solutions and how our Succession Planning Launch Series can help your organization select and develop the next generation of talent.